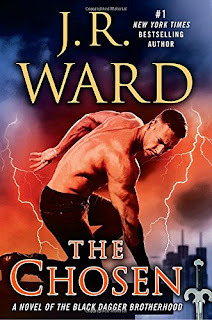 The Black Dagger Brotherhood universe is huge, each book in the series features a myriad of characters and issues in addition to the central romance, and this latest installment is no exception. The Chosen, book number 15 in the series, is the long-awaited story of Layla and Xcor. I have to admit as much as I love the BDB universe the books are getting successively more debilitating, because nothing is sacred, nothing is safe, nothing is forever. This is so unnerving for me as a reader that for this series only, I have to read the last chapter before I read the book to make sure the main characters are all in tack and happy. Seriously. I mean - remember The Shadows, Book 13? (Spoiler Alert) Ms. Ward killed the heroine!? Who does that? At the start, we find our heroine, Layla, the Brother Quinn, and his husband/soldier Blay happily ensconced in the Brotherhood’s mansion living a seemingly happy domestic family life. All was well as I turned the pages, but this is a J.R. Ward book so I didn’t get too comfortable because I knew this familial tranquility couldn’t last. However, I did not expect things to blow up with such ferocity, on so many levels, to so many characters, so quickly. Xcor and his Band of Bastards are wanted for high treason after their assassination attempt on the King. I wondered how Xcor was going to come back from that and become the hero of this book, and in that respect, the author has done an excellent job. As she has done in her previous books, the flashbacks to a character’s history reveals their emotional and troubled past giving us a better understanding of how they came to be who they are. Xcor’s physical disfigurement gave him a world of hurt in a mother who abused and then abandoned him and a father who had absolutely no use for him. For centuries, his existence was shaped by men whose cruelty was limitless. The heroine, Layla is one of The Chosen who has spent centuries in a gilded cage serving the Mother of her race - The Scribe Virgin. That Layla and Xcor, two seemingly disparate characters, would find each other and fall in love is the stuff of romance novels. Their love is forbidden. After all he did try and kill the king. When Layla tells Quinn that she is in love with Xcor all hell breaks loose and she is sent away. And so, the misery, uh, I mean story begins. After a protracted and angst filled journey the Chosen, Layla and the head of the Band of Bastards, Xcor finally have what I would call is an extremely happy ending. The kind of Hallmark happy ending that makes you sigh, smile and dab a happy tear from your eye. However, I was pretty much exhausted by the end of the book. My head was spinning and I was left with a feeling of foreboding. A feeling that the next few books were going to be an exercise in misery for the BDB. It’s the cliffhangers, ever changing and evolving world, and new insights into established characters that keeps readers coming back. Just when you thought everything was settled, the author throws in a “what if” you could never have imagined. In The Chosen, the Brother Vishous, who has had two previous books dedicated to him and has already had his happy ending, is once again questioning his relationship. And not in a good way. To some readers this may be maddening. For me? Not so much. I think Ms. Ward is brave to continually keep her world alive and in fact a bit messy. So messy in fact (Spoiler Alert) the mother of the race, The Scribe Virgin, is no more. Oy! Didn’t see that one coming. Now the new head of the race (you’ll have to read the book to find out who that is) is feeling their way on how to fulfill the prophecies of the race. In the end, The Chosen leaves us with a new villain, new heroes and a new threat to the Vampire race. Never a dull moment as the war between the Vampires and the Lessening Society continues to wage. And seriously - I can’t wait to find out what happens next. What are some of your favorite long running series and why? I've never read any of Ward's BDB books though I have many friends who are addicted to them. I am hooked on her Bourbon Kings family saga and have been counting down the days until the third book, Devil's Cut is released August 1st. A few long running series that are among my favorites are Emily March's Eternity Springs, Julie Anne Long's Pennyroyal Green and Julia Quinn's Bridgertons. Thank you for writing the reviews. Alina - You made me laugh. I know exactly what you're talking about. It can get frustrating. PJ - One of my all time favorite series is Robyn Carr's Virgin River. Virgin River is one of my favorites too, Maria. I haven't read Virgin River, but I remember trying one of Ms Carr's books. I was prepared to be stressed with The Chosen. It's a series I'm hooked on now and I'm so emotionally invested I couldn't stop if I wanted to. lol I too always feel exhausted when I follow the story to its HEA. My other favorites are Outlander, Virgin River, Fools Gold and JD Robb's In Death series. Love Roarke. I'm rereading Celebrity in Death, and Roarke is too good to be true... But I don't want him any other way!